If you or your loved one are ill and would like to be included in the prayer intentions of the Divine Mercy Prayer Team Ministry, please e-mail divinemercy@allsaintsdunwoody.org. Also, if you would prefer, we can coordinate a time for two of our members to come pray the Chaplet of Divine Mercy in your presence and/or the presence of your loved one. There are two ways to be part of the Divine Mercy Ministry at All Saints!! The Divine Mercy Prayer Team Ministry prays for intentions that are given to us. DM Team members include these intentions in their Divine Mercy Chaplet and other prayers. We have been blessed to be part of many miracles that have occurred through the powerful Divine Mercy Chaplet prayer, including sending many souls to a peaceful eternity with Jesus’ promise of His mercy. This is all done through email — no meetings! A prayerful heart and trust in God are all that is needed :). The Divine Mercy Planning Team Ministry has a mission to promote the message of Divine Mercy as given by Jesus to St. Faustina Kowalska in her diary, Divine Mercy in my Soul. This group meets monthly and works to incorporate the Divine Mercy message and Chaplet into our parish life and outreach. Please contact Kitty Moots at divinemercy@allsaintsdunwoody.org to join in this ministry of spreading the powerful message of Jesus’ Divine Mercy! This devotion has different components: it involves a divinely inspired painting of Jesus with attached promises for its veneration, vocal prayers (the Divine Mercy chaplet and Divine Mercy Novena), a book (The Diary of Faustina Kowalska), a Holy Hour (3 o’clock), and a solemn feast day with attached indulgences (Divine Mercy Sunday). 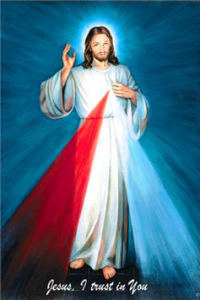 The earliest element of the devotion to the Divine Mercy revealed to St. Faustina was the painted image. Jesus also taught St. Faustina prayers to implore his Divine Mercy. “Say unceasingly this chaplet that I have taught you. Anyone who says it will receive great Mercy at the hour of death. Priests will recommend it to sinners as the last hope. Even the most hardened sinner, if he recites this Chaplet even once, will receive grace from My Infinite Mercy. I want the whole world to know My Infinite Mercy. I want to give unimaginable graces to those who trust in My Mercy” and later, “When they say this Chaplet in the presence of the dying, I will stand between My Father and the dying person not as the just judge but as the Merciful Savior”. During the Divine Mercy Novena leading up to Divine Mercy Sunday, the Chaplet of Divine Mercy should be prayed each day for that day’s intentions. Of course, this novena can also be prayed year-round whenever we want to entrust a particular intention to Jesus’ mercy. Jesus also told St. Faustina that the hour He expired on the cross is the hour in which to especially implore the attribute of his Divine Mercy, because at that moment his saving mission was accomplished and his blood and water was poured out on the cross for the sins of the whole world. Because Jesus made the 3 o’clock hour sacred, whenever the clock strikes this hour, his mercy can be efficaciously implored. Jesus requested that a special feast devoted to his Divine Mercy take place on the octave day of Easter (the second Sunday of Easter), a day in which he would pour special graces out on the whole world. Jesus grants an indulgence (either full or partial remission for the temporal punishment of sin) for all who will participate in this feast and implore his Divine Mercy. Divine Mercy Sunday Prayer Service at All Saints! All families are invited to join in this day of extraordinary grace and promise! On this day, Jesus told St. Faustina, “The soul that will go to Confession and receive Holy Communion shall obtain complete forgiveness of sins and punishment” (Diary, 699). During this special prayer service, let us especially remember our loved ones who have strayed from the Church, that the Lord will touch their hearts to return to the Church and deepen their fervor so that All may be One! Jesus asked Saint Faustina that Divine Mercy Sunday be preceded by a Novena of Chaplets beginning on Good Friday. The Chaplet should be offered each day for the days intention specified by Jesus. Please see below under “The Novena” for details. “By this novena (of chaplets), I will grant every possible grace to souls” (Diary, 796).